If you're looking for revolutionary potential, unprecedented hype, and fierce controversy, you can't do much better than stem cells. Celebrity spokesmen praise stem cells as a miracle cure for apparently everything, while politicians argue whether the use of embryonic stem cells is equivalent to murder. As a field, stem cell biology is just starting to come into its own. A LOT more research is necessary before it can live up to the lofty expectations we've built up. But the scientific breakthroughs are coming fast. be used to cure diseases like Alzheimer's and Parkinson's, or spinal cord injury. Given the complexities of stem cell science, and the fact that misunderstandings often cloud the debate over this research, I'm going to focus here on explaining the basic background leading up to Karen's work. Then I'll briefly show how her findings fit into the larger context of stem cell research. To understand new discoveries in this field, it's necessary to understand how stem cells work. A helpful analogy is people and their career paths. 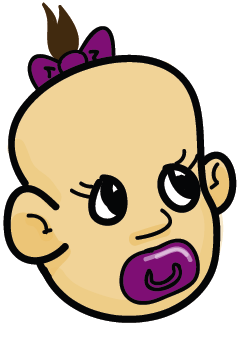 To start, let's consider a baby. A bright-eyed bundle of possibilities. She could be virtually anything when she grows up - it all just depends on her environment and her education. 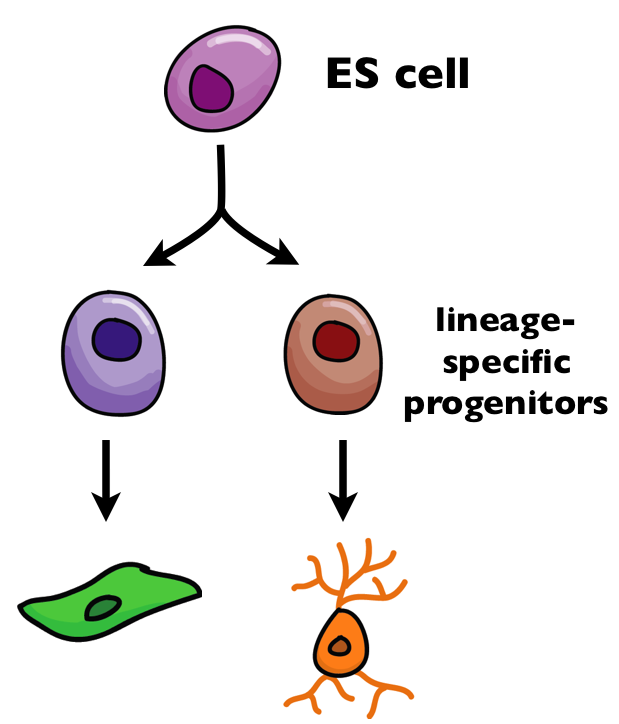 This most basic initial state is equivalent to an embryonic stem cell (ES cell). These are the cells that give rise to every type of cell in the body. As you might expect, the journey from a cluster of ES cells to a complete human body is a long and complicated process, involving countless diverging pathways that lead to vastly different cellular "fates." Similarly, our baby girl has a long road ahead of her. She gets a little older and starts kindergarten, where she imagines all the different things she could be when she grows up. As she continues in school, she finds that she has a knack for math and science. So even though she's exposed to many other subjects, the math-science tendencies are strengthened and eventually this leads her to choose biology as her college major. After years of hard work, the big day comes when she graduates from college, and now we can officially call her a biologist. There are still many career possibilities, but they're mostly limited to the field of biology. 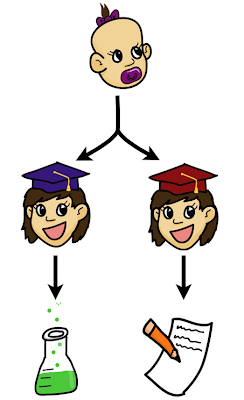 In our stem cell analogy, she's now a lineage-specific progenitor cell. Not yet at a mature, final stage of development, but far from the initial blank-slate of an ES cell. 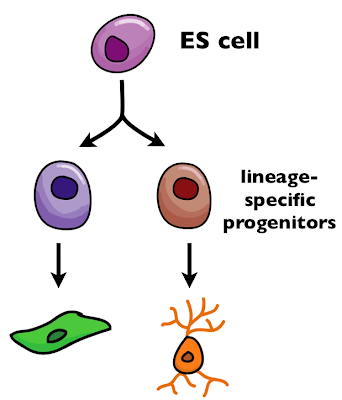 From this progenitor state, the path to terminally-differentiated mature cells is relatively straightforward. Neural stem cells, for instance, can either become neurons or support cells known as glia. The complications - and the exciting promise of stem cells - arise when we want to change fate. To use a common example: Parkinson's disease involves loss of the neurons that produce dopamine, so wouldn't it be great if we could replace those neurons somehow? One strategy is to start with embryonic stem cells and turn these into dopamine-producing neurons that can be transferred into the patient's brain. Unfortunately embryonic stem cells are a scarce and controversial resource. 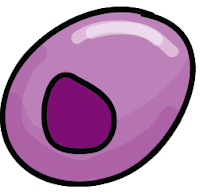 So instead, it might be better to take some of the patient's own cells (e.g. from skin) and transform them into neurons. A fabulous idea but incredibly difficult to do. This is where Karen's research starts. A few years ago, scientists discovered that under the right conditions, fibroblasts from adult skin could be "de-differentiated" into a more immature state called an induced pluripotent stem cell (iPS cell). In other words, the normally one-way path of cell fate is reversed. iPS cells could then be made to follow a different path and become neurons. This was an incredible breakthrough that will probably lead to a Nobel Prize. However, it's not perfect. The process of de-differentiation is very complicated and time-consuming. Even more discouraging, iPS cells tend to grow out of control and form tumors. A promising alternative is "direct differentiation," which skips the iPS cell step altogether. Take skin cells and turn them directly into neural stem cells, and do it in as simple a way as possible. And that's exactly what Karen and her colleagues did. Using a single transcription factor called Sox2, they directly differentiated fibroblasts into neural stem cells, which could then become functional neurons (my contribution to the project was verifying that these cells did indeed function like neurons). 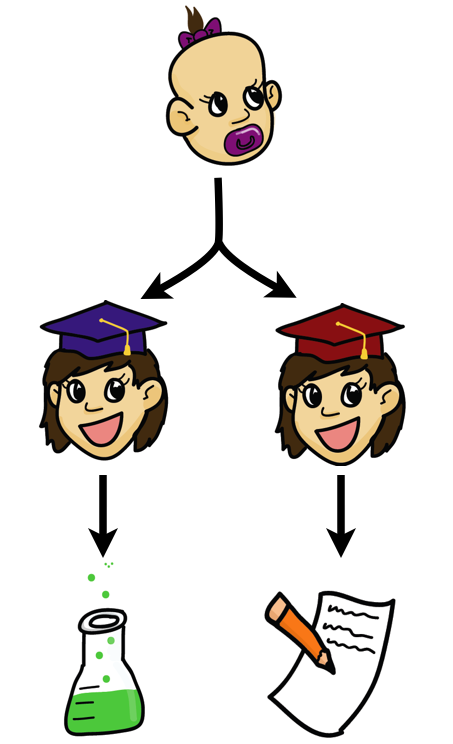 Briefly coming back to our baby girl who's all grown up and is now a freshly-graduated biologist... Let's suppose that she decides she doesn't want a career doing biology research - she wants to be a writer. But she didn't follow this pathway before. We could say she's currently like a fibroblast. But she really wants to be a neuron, a.k.a. science writer. So she has the option of de-differentiation into an iPS cell, i.e. going back to school to get trained as a writer. But de-differentiation is a long and risky process. It'd be more ideal to be directly differentiated into a writer. Someone who is recognized as a lineage-specific progenitor cell with the potential to eventually become a mature, functional science writer. Some day. The results of Karen's work are a great advance for the field of stem cell biology and an important first step for future research. With a fast, direct way to generate neural stem cells, scientists can focus on creating specific types of neurons. The brain contains thousands of different types of neurons, each with distinct properties, and with a slightly different pathway that led to its fate. Quite a challenge. And the greatest challenge of all will be figuring out how to integrate the newly-created neurons into an actual brain. Like science writers, neurons need to form the right connections to be truly functional. These issues are guaranteed to keep researchers busy for decades to come, but, with advances like Karen's, stem cells may some day live up to the hype.